Wow, I don’t know where to start. 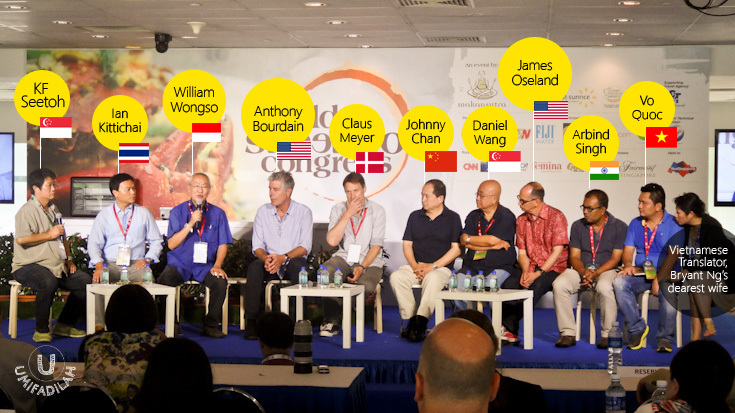 It’s been over 2 weeks since my WSFC (World Street Food Congress) trip to Singapore, until I finally decided that I owe this blog some nice, thorough post about the whole journey. One thing for sure, I’m overwhelmed. And grateful I had the chance. The hospitality was amazing. By the time I arrived at the airport, they held a signage with my name in it - made me feel like a real VIP, lol. Our hotel was also quite nice, huge king bed all for myself, free shuttle to the WSFC venue and to the airport, etc. As Femina blog contest winner, originally the prize was to attend only the WSFC Jamboree, which covers S$28 entrance + food coupons. But the Makansutra committee contacted me and they gave an additional spot for me to sit as "media", accompanying Rani Djoeir, Femina's representative at the 2-days Dialogue, which would normally cost around S$630 (money-wise), but at the same time.... priceless. Experience-wise. I'm a happy woman. Thanks Seetoh! Thanks Carol! It’s definitely my first time attending congress/seminar other than some technical Developer Conference :p. Let me tell you one thing, FOOD CONFERENCE IS WAY BETTER. True, that the speakers don’t really care about the look & feel of their slides. In fact, some looked really ugly & cluttered. But as long as they showcase lots and LOTS of food slideshows enough for me to drool by the time it reaches slide #2… then it’s fine. It's super fine. Heck, Anthony Bourdain didn’t even prepare a single deck, only a video, then for the rest, it’s the lifetime experience that spoke for himself. YES, I WAS STARSTRUCK. BY CULINARY ICONS ALL AROUND THE WORLD. Seeing Anthony Bourdain was like seeing Bill Gates back in 2008 when he had Presidential Lecture in JCC Senayan. Starstruck. Gives chill to the bone. And I'm acting all teenager again. True, I don't watch each episodes of "No Reservations" or his new 2013 series, "Parts Unknown". I don't even own a single book that he wrote (well, I'm planning to). But after hearing this guy talk, seeing his gesture when he talks about food, and share his around-the-globe experience, man.... do this man have the most interesting life or what! I could tell that his passion for street-foods is excessively big. Of course, the Dialogue isn't all about Anthony. There were some real big culinary experts, and I'm proud that Indonesia was represented by these 3 individuals: William Wongso, Bondan Winarno, and Iwan Tjandra. Some other big names including Thailand's very own Iron Chef winner, Ian Kittichai, to the Foodcarts Portland (Oregon, US) co-owner, Brent Burmeister. From Vietnam's most prominent Chef Vo Quoc, to the co-founder of Noma in Denmark (voted THE BEST RESTAURANT IN THE WORLD for 3-times in a row, but moved to 2nd position this year), Claus Meyer. Whoaa... definitely adding 'going to Denmark and eat at Noma' to my bucket list. Anyway, if you're curious on the whole Dialogue programme, please refer to this. Panel Discussion WSFC Council Members. Seeing William Wongso did a quick fire demo along with KF Seetoh, the founder of Makansutra & also the Food Ambassador of Singapore--pointed by Singapore President himself (we call him “Pak Bondan-nya Singapura”, else, The New York Times call him "Food Guide Maven"! ), was one of the wittiest live cooking show I have ever seen in my life. He did our popular 'Asinan Betawi' and gave free sample tasting to the audience. It was good, and fresh! Seeing Pak Bondan Winarno presenting 1001 types of Sate, Soto, and everything else on the topic of "Indonesia: Beyond Sate & Nasi Padang", was just mouthwatering. Awesome. Check out some of his slides below, I couldn't agree more! Seeing Pak Iwan Tjandra, the man behind one of the most successful food court chain, Eat&Eat, that also changed the dining landscape across Java. 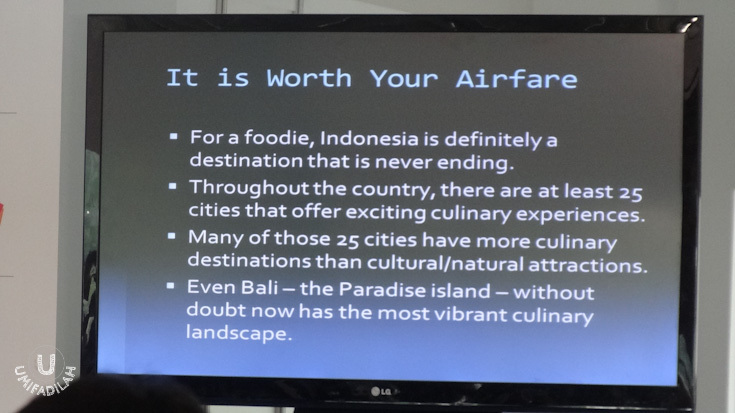 It is said that one can't talk about F&B business in Indonesia, without mentioning his name. Hearing the stories of how street-foods started in America, specifically in Portland, Oregon, from Brett Burmeister himself, was so enjoyable and easily digestible. This man co-owns FoodcartsPortland.com, a portal that acts as practical guide on the nation's best street food. He also advises street food vendors and helps them operate successfully within the often bewildering mobile vending laws. James Oseland (in red shirt), the editor-in-chief of Saveur, America's most critically acclaimed food magazine since 2006. Even though I couldn’t attend his session at Dialogue Day 2, I watched him talking at Day 1 Closing: WSFC Council members' panel discussion. He has a sharp mind, it was really an eye-opening conversation and I believe that these people are truly the experts when it comes to food. The man in dark grey polo shirt, is Arbind Singh. He's the coordinator of the National Association of Street Vendors of India (NASVI), which aims to protect and promote the rights of more than 500 000 street vendors. Johnny Chan (left, with hair), a TV host of Traveler, a popular food programme on China's Travel Channel, and probably one of the most watched food personalities on earth from China. Danial Wang (right, holding mic), Singapore's ex-Commissioner of Public Health/Director-General of Public Health. KF Seetoh from Singapore (left) and Thailand's Iron Chef Winner, Ian Kittichai (real name: Pongtawat Chalermkittichai) holding the microphone. From the audience point of view. On a scale of 1 to winning-a-lottery level of happiness, I was super ecstatic. It's not every year I got this kind of special opportunity, and I'm pleased I got the opportunity. Big thanks to Femina, to Unin Rani whose been a really great eating buddy, a friend, and also an advanced swimmer (she swims 80-laps minimum! lol) . To Makansutra, KF Seetoh, Carol, and other committee that made this event possible. To Indonesian contingent, new friends, and all, it was great pleasure to know you guys.